Part of an occasional series of reviews from my product management bookshelf. 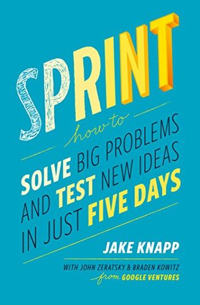 Why you should read this book: Sprint is a recipe-like guide to running your own design sprint. Think of it as “Design Sprints for Dummies”. For those of you familiar with the “Dummies” line of books, they were famous for bringing hard concepts to anyone willing to learn (think investing, etc). Or if you’re a cook, think of it as if one of the Cooks Illustrated folks wrote a book about design sprints. Jake Knapp has run over 100 of these sprints and his advice shows this experience. The exercises are valuable and repeatable which makes this book indispensable for product teams. What’s unique about this book: It’s the ONLY book solely dedicated to Product Discovery. If you want to self-educate on Product Discovery, start by reading this book and doing a sprint with your colleagues. Jim’s Advice: Though this book makes design sprints accessible to everyone, it could do more to focus that time spent on valuable problems (this is the Marty Cagan influence here). The most common mistake in design sprints is to focus on usability and task completion rather than whether the user actually wants/needs the concept being tested. Sprint could do more to warn against this common pitfall. (my session) Affinity Mapping with Problems. In the section “Organize How Might We notes” in the book….instead organize the HMW notes by problems. You will need to spend some time restating HMW notes into problem statements and going deeper into the problems.Then you can dot vote on problems which leads to a better final focus for the design sprint. I have a hard time keeping groups engaged in the Storyboard session so I typically simplify the prototype(s) (which is easier to do when you focus on value over usability) and just have a group conversation with the prototype maker about the storyboard and then iterate throughout the day. We still split out roles to make the prototype: copywriting, recruiting, asset gathering, etc. There’s so much detail in the book that it’s spawned a cottage industry of digest guides even one from the authors. Even the Google.com designers only do three day sprints which I learned at a Product Tank meetup where they did an overview workshop. Style: Prescriptive like a recipe. Should be read front to back. And then can be used as a reference.